Tea is one of the most popular beverages in the world. Making tea can be a sophisticated ritual or ceremony and it has become an integral part of many cultures, especially in Asia. Tea plants are mainly cultivated in tropical and sub-tropical climates with a minimum annual rainfall of 45 to 50 inches (1,140 to 1,270 millimetres) — areas that are also home to tropical and sub-tropical forest ecosystems rich in biodiversity. 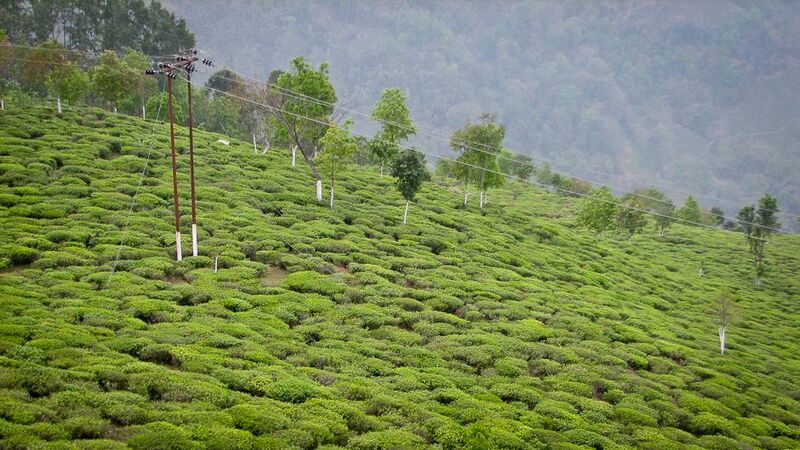 However, most tea plantations across the world are intensive monocultures and lack biodiversity. Development of these plantations depends heavily on external inputs of labour and chemical fertilizers. Monoculture plantations are also vulnerable to attack by pests as they lack the biological diversity that would allow natural pest regulation. According to Food and Agriculture Organisation statistics, in 2008, the total areas of tea production in China, India, Sri Lanka, Kenya and Indonesia — the five leading countries in tea cultivation in the world — reached more than 2 million hectares. As the number of tea consumers continues to grow, the challenge is to produce tea that is good for human health, but not harmful to ecosystem biodiversity. The good news is that there are various intercropping systems that combine tea and other tree species — including various fruit trees, timber or multi-purpose trees — that have benefits in addition to tea production. 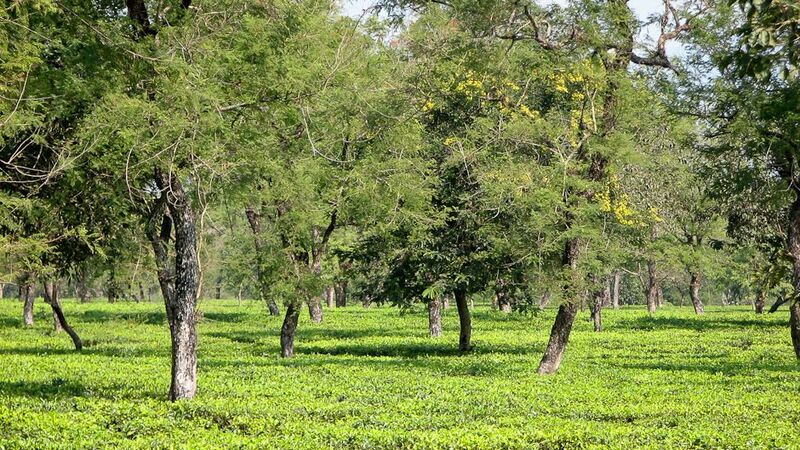 Some common timber trees planted in tea plantations include albizzia, cassias, alder and camphor; the latter is thought to improve the quality of tea. These can provide local communities with timber and firewood. What’s more is that intercropping can improve the ecology of tea plantations by: helping to conserve water and decrease soil erosion, increasing organic soil matter, suppressing weeds and pests, and providing shade, especially during droughts and dry seasons. However, there exists an even better way to harmonise tea production with conservation of ecosystems: tea forests, also referred to as ancient tea gardens. 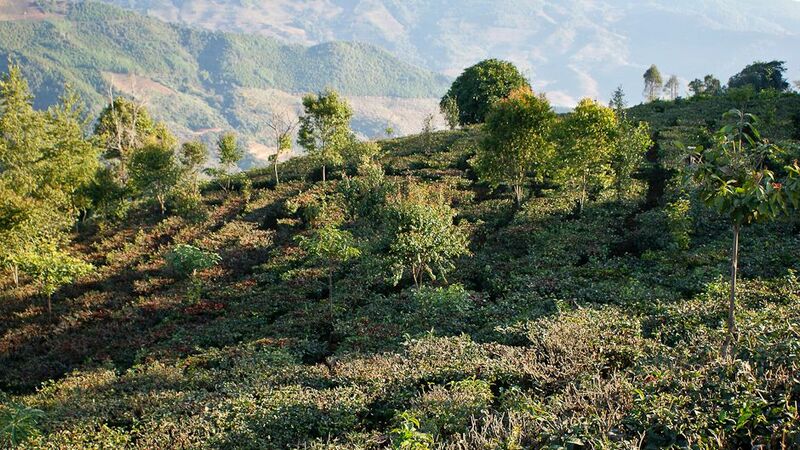 One example of tea forests can be found in Mangjing Village in the south of China’s Yunnan Province. 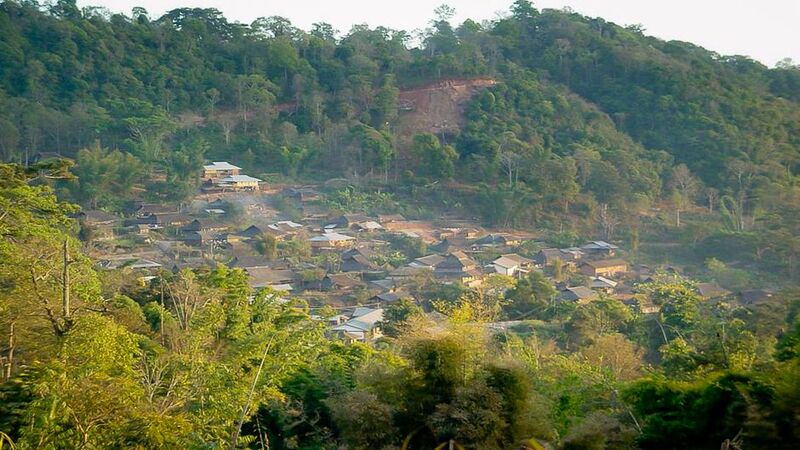 Mangjing is inhabited by the Bulang people who live in amongst China’s tropical and sub-tropical humid forests at an altitude of about 1,500-2,300 metres, as well as across the border in nearby Myanmar. Mangjing’s traditional tea gardens were created by village ancestors many generations ago. In fact, the oldest tea tree in Mangjing is thought to be 1,300 years old. 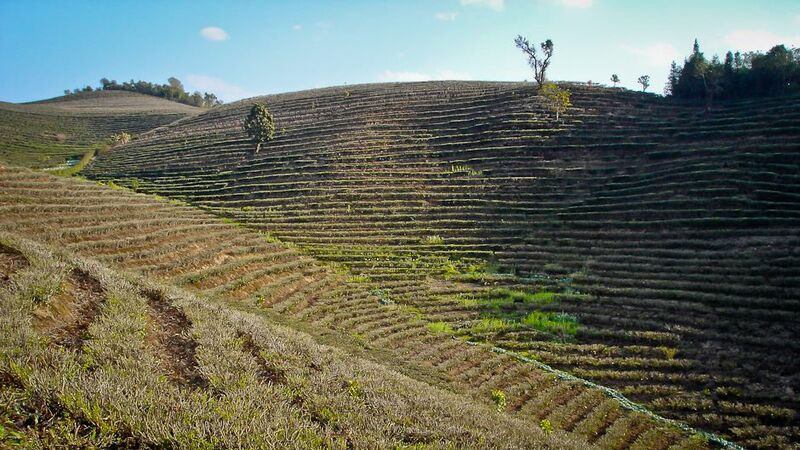 The Bulang are thought to be one of the earliest cultivators of tea in Yunnan Province. Established during the East Han Dynasty (25-220 AD), Mangjing is home to 586 households and a population of 2,406. In 2004, per capita income was just 515 Yuan (US $65), of which over 80% came from selling fresh tea leaves to tea processing factories. Mangjing’s traditional tea gardens were created by village ancestors many generations ago. In fact, the oldest tea tree in Mangjing is thought to be 1,300 years old. To collect tea leaves from this and other tall trees, local Bulang people need to climb very high. The natural tree canopies above traditional tea gardens are so well maintained that it is impossible to tell the tea gardens from natural forests at a distance — a real model of tea production that works in harmony with conservation of forests and biodiversity. In a recent study by the Chinese Academy of Sciences, scientists identified 15 rare and endangered plant species in the tea forests that are difficult to find even in natural forests. Based on a sampling survey, 244 species were found in tea forests, which is comparable to the number of species found in natural forests nearby. The forest canopies suppress weeds and provide fallen leaves and litter as ‘green manure’. The canopy trees also protect soil from erosion on the steep slopes in contrast to intensive tea plantations that rely on costly terracing. Forest canopies nurture natural enemies, such as spiders, birds and wasps that control pests in the tea gardens. Local Bulang say that wasps do not attack them and that wasps and people get along with each other. 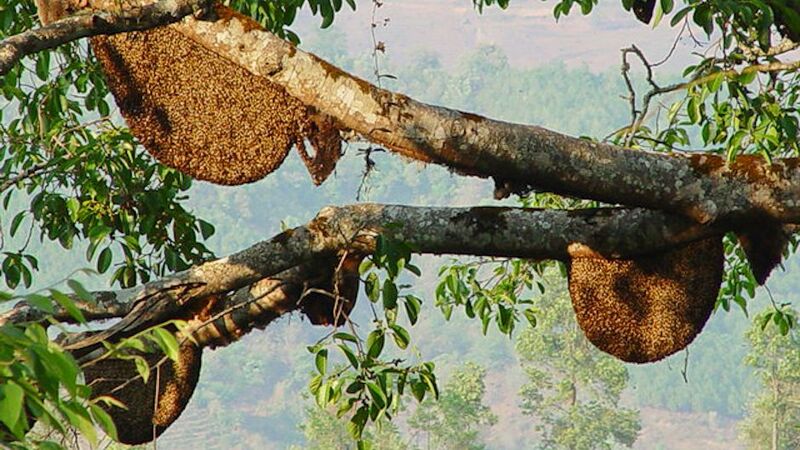 It is prohibited to collect wasp grubs and larvae in the village in order to maintain this harmony between humans and other species. 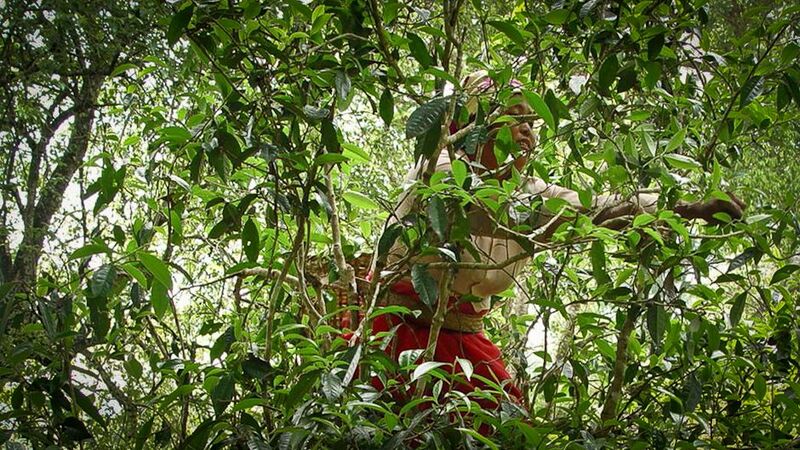 For the Bulang people, the tea forests passed down over generations are part of their traditional culture. Tea is more than just a drink here. 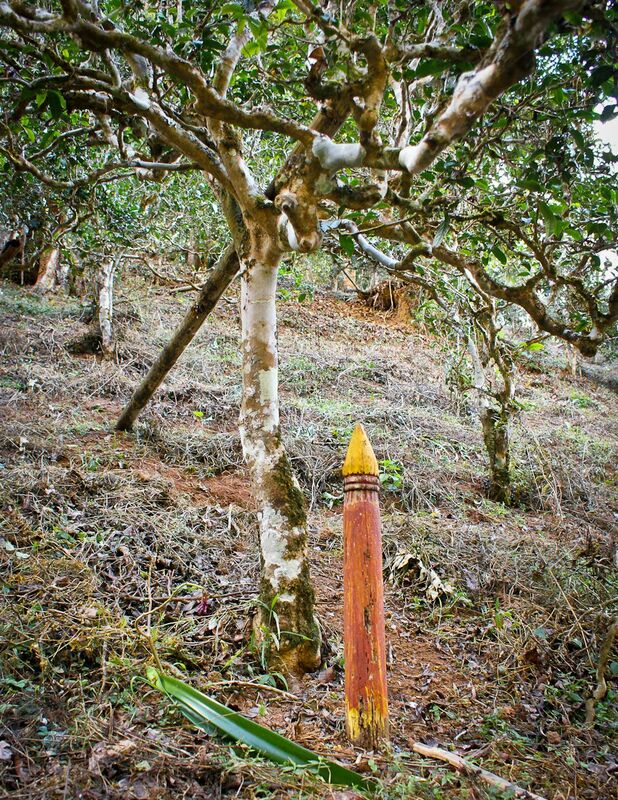 The oldest tea tree in each family plot in the tea forests is worshiped as the crutch for a family’s livelihood (see Photo 7). The Bulang think that those without tea gardens are lazy. Tea cultivation is encouraged. Drinking tea is part of their daily life. Guests are treated with tea. Tea is also used as a herb and as medicine. “Pa-ai-neng is our ancestor, who has left us the bamboo house and the tea gardens as the crutch for our livelihoods.” — Bulang proverb. Towards the end of the dry season, during mid April, the Bulang celebrate their Tea Ancestor Festival in honour of Pa-ai-neng. Village elders pray for a good harvest and happiness in the coming year and then the villagers make offerings of rice and dance around an altar in a tea forest. Bulang tea, produced without polluting fertilisers and pesticides, depends on forest ecosystem services such as nutrient recycling and pest regulation. Not surprisingly, local “pu-erh tea” from tea forests is high quality and highly valued in the wider Chinese market. As a result, the tea forests have become an even more important source of income and, nowadays, an eco-tourism attraction. In dealing with this trend, the Mangjing village has formulated rules for protection of tea forests and begun efforts to strengthen traditional culture and promote conservation of tea forests. Yet, in spite of relatively high prices for fresh tea leaves collected from tea forests, local people gain very little in the chain of tea processing and marketing. Some families have begun doing their own processing and marketing, but the scale of processing required is challenging and their skills in marketing are still very limited. 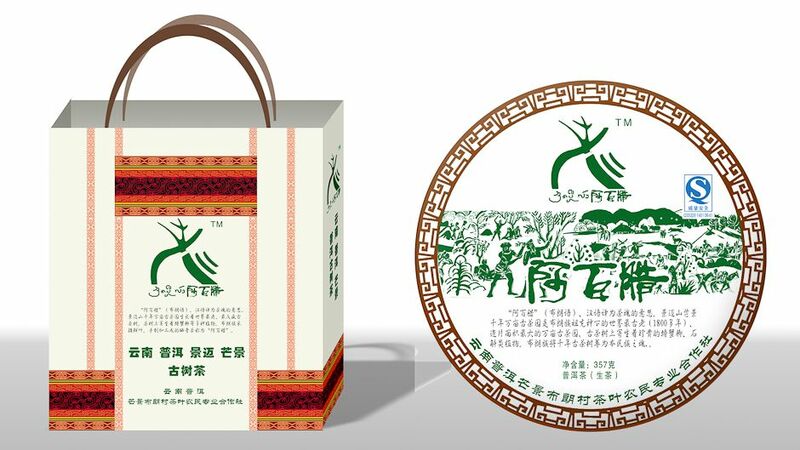 Local people have pooled their efforts via the Mangjing Tea Producer Cooperative, with support from the Yunnan Academy of Social Sciences and financial support from the Ford Foundation since 2005. Monitoring collection and processing of tea, the coop aims to ensure high quality and prevent mixture of tea harvested from forests with that from terraces. 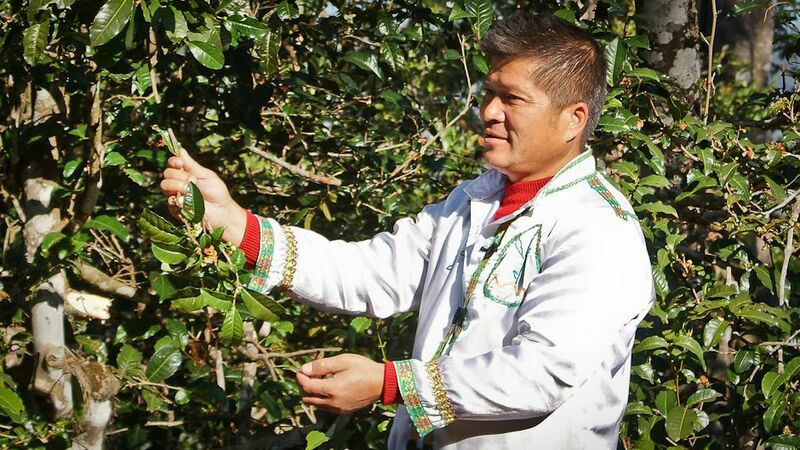 The cooperative also provides members with technical guidance on tea production, forest protection and the improvement of tea by inter-planting other tree species. The community has built up their own brand “阿百腊” (Abaila), meaning traditional tea in the Bulang language, which is still not well known across China (Photo 11). Purchasing fresh leaves from members with a guaranteed price, the cooperative also rewards members with a dividend at the end of each fiscal year. Despite good progress, the effort is still in its early development. Mr. Nankang, Executive of the cooperative, told this author that marketing remains a big challenge as the community is short on necessary skills. Wider interest in Mangjing Villages’ wonderful tea forests could not only help promote biodiversity-friendly methods of agriculture in low-carbon production landscapes, but might also help the Mangjing Tea Producer Cooperative market their quality tea and reduce poverty amongst the Bulang. The Tea Forests of Yunnan by Luohui Liang is licensed under a Creative Commons Attribution-NonCommercial-ShareAlike 3.0 Unported License. Luohui Liang is an Academic Programme Officer of the Global Change and Sustainability Section at the United Nations University Institute for Sustainability and Peace (UNU-ISP), Tokyo. Previously he was the Managing Coordinator of the UNU global initiative on People, Land Management and Environmental Change (PLEC) (1998 to 2002), an Honorary Research Fellow at the University of Aberdeen, Scotland (1995-1996) and a Land Use Planning Officer at the Yunnan Bureau of Land Management, China (1987-1998). His research interest covers sustainable management of land and biodiversity in agricultural landscapes. Thank you for writing about this. As someone interested in sustainable tea production, I was wondering if any research has been conducted on yields and/or the economics of both tea and non-tea crops in these forested agro-ecosystems? I would greatly appreciate the names of any papers or other information. Thank you for this article. I would love to go there on my next visit to Yunnan. Thank you so much for this enlightening article. As an aficionado of fine tea, I feel like I must go and see the village of Nangjing and buy some Abaila tea during my next trip to Yunnan .